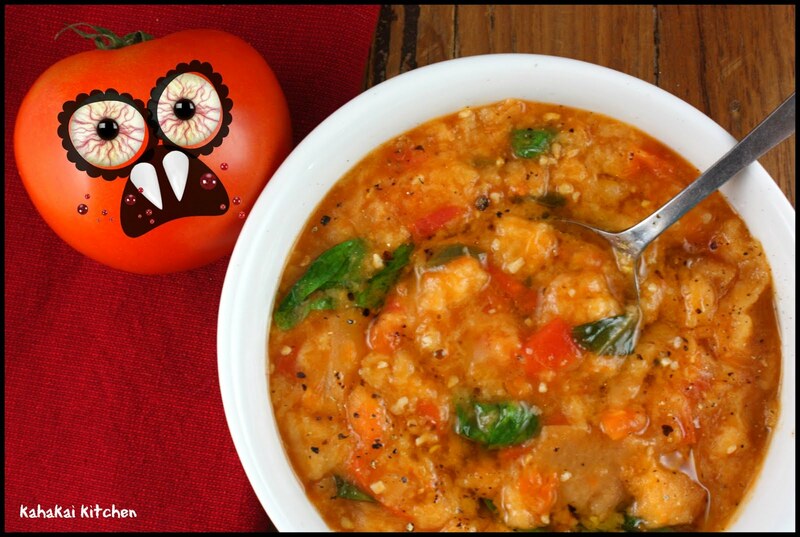 In about one third of the time that it will take you to watch the film Attack of the Killer Tomatoes, you can make this bowl of simple, hearty Bread-Tomato-Garlic Soup. And, I do recommend that's where you spend your time--the soup not the movie. Elizabeth at The Law Student's Cookbook selected this campy "horror" movie as our Food 'n Flix pick for October--a very fitting choice. Although I generally like B-rated cult-status films, I just couldn't quite get into it this round. Filmed in 1978, (I vaguely remember watching it as a child), the years have not been kind to this film--I think my only real laughs came from the clothing and bad low-budget special effects. Still, seemingly harmless tomatoes intent on taking over the world did inspire this delicious dish. This recipe comes from the Jill Dupleix cookbook of the same name, Bread Tomato Garlic--featuring recipes with three "main player" ingredients. The three are used beautifully here in a thick, velvety soup. 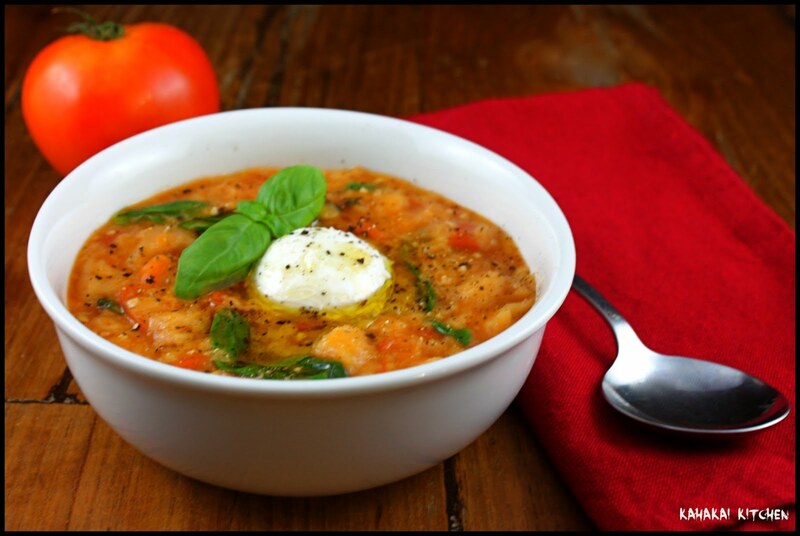 Jill Dupleix says, "A soup that's really a salad: sourdough bread, rich, ripe tomatoes and your fruitiest olive oil." Remove crusts from the bread, thickly slice and cut into 3/4-inch cubes. 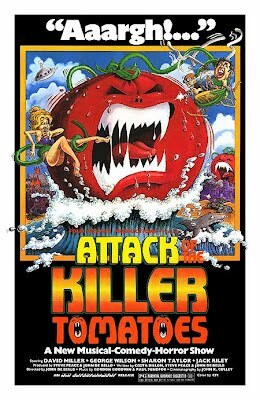 Coarsely chop the tomatoes, and smash the garlic with the side of a knife until flattened. Heat the olive oil and garlic in a heavy saucepan. When hot, add the tomatoes and cook, stirring for 5 minutes. Add the broth gradually, stirring, and bring to a boil. When the mixture is bubbling, add the stale bread cubes, salt and pepper, and cook, stirring, for another 5 minutes. Toss in a handful of fresh basil leave sand stir them through. Cover and simmer over very low heat for 20-30 minutes. Stir every now and then, squashing some of the bread into the soup with a potato masher or the back of a wooden spoon. Remove from the heat and leave to cool for a while. Serve warm, drizzled with extra olive oil. Notes/Results: So simple and good. The bread makes this soup thick and smooth. I added a little extra garlic to mine and put half of the basil in when the recipe called for it and the other half in at the end. Playing off of Dupleix comment that this is a soup that is really a salad, I topped mine with a little fresh mozzarella, making it Caprese-ish. This soup is pure comfort food and I would definitely make it again. Thanks to Elizabeth for picking a fun October film. 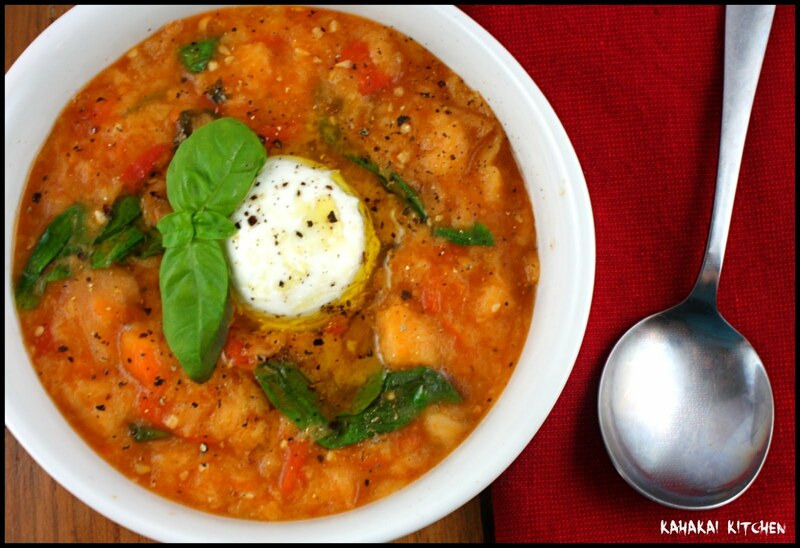 She'll be rounding up the killer tomato-inspired dishes on her blog in the next few days. Have a hankering for films and food? Join us for the next Food 'n Flix pick, Julie and Julia hosted by La Cocina de Leslie. 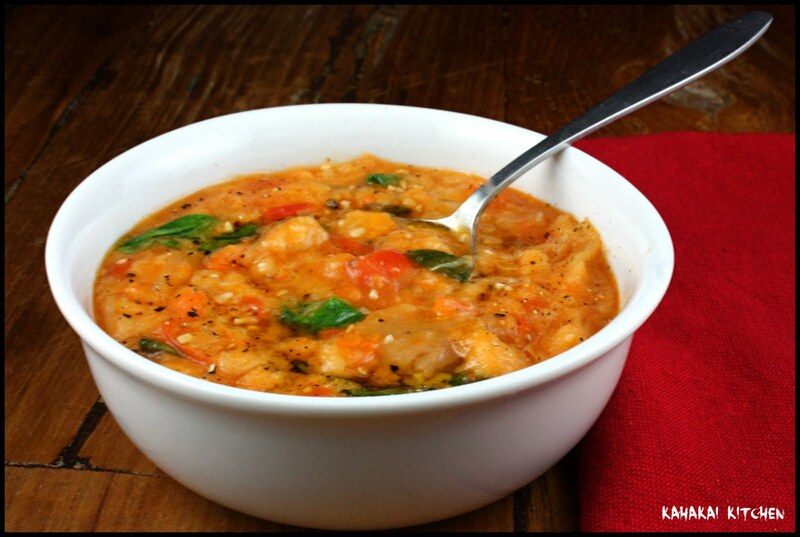 Now let's visit the Souper Sundays kitchen and see what dishes await. Foodycat has a new addiction--Nduja--rich, spicy, paste-like sausage from Calabria and used it to make this hearty Ndjua Meatball Minestrone Soup. She says, "The flavour of the pepper stuffing started me thinking of meatballs. And as the weather has turned distinctly autumnal, it led my thoughts towards soup. A big pot of minestrone, thick with stelline, beans and vegetables, with balls of 'nduja-and-sausagemeat poached gently in it. The chilli-warmth worked its way through the whole pot of broth." Dave from Inspired by eRecipeCards joins us for the first time at Souper Sundays with two soupy bowls of goodness. First is this Garlic Garlic Chicken and Dumplings. Dave says, "Not a typo, double Garlic. And as good as that sounds... It tasted better. In fact, I am out on a limb here, but I really think this is about the best thing I have ever made. A terrific garlic seasoned vegetable chicken soup, but on top are the most amazing garlic cheese dumplings. I cried just a bit when the leftovers were gone." Next, Dave shares this Chicken, Kale, Sweet Potatoes in a Silky Butternut Squash Soup and says, "Today's soup wasn't waiting for Indian Summer, this beauty was made with a base of creamy silky butternut squash (thickened with a roux and pureed). The meat of the soup was cubes of fried Sweet Potatoes for texture (and health), some Kale for color. texture and even more health and some of my beloved store bought, fully cooked, fully seasoned Rotisserie Chicken..." Welcome to Souper Sundays Dave! 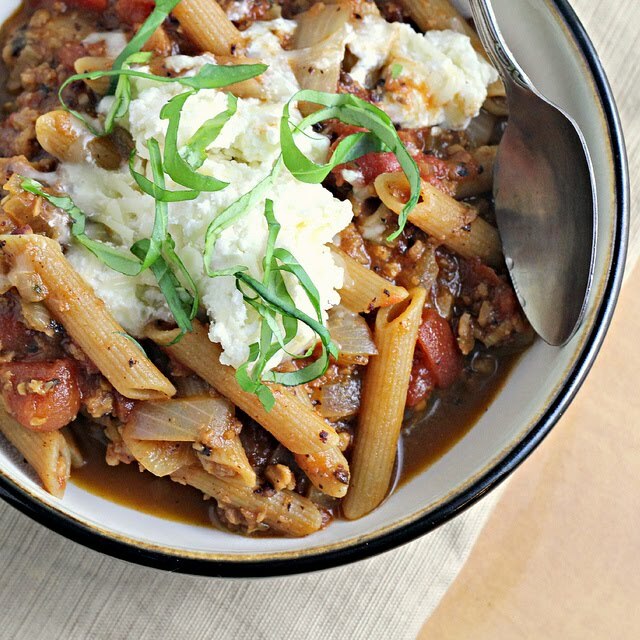 Joanne of Eats Well With Others created a fun soupy spin on a classic dish with her Lasagna Soup and says, "My grandmother didn't make lasagna. Perhaps that is why I've never felt that bad taking what should be tradition and transforming it into something totally unrecognizable. Omitting key ingredients, adding in a rainbow of vegetables that wasn't there before, or saying "who needs an hour of baking or a tray of cheesy perfection...just throw it all on the stovetop and call it soup!" As it turns out, without a gold standard to compare it to, anything goes." 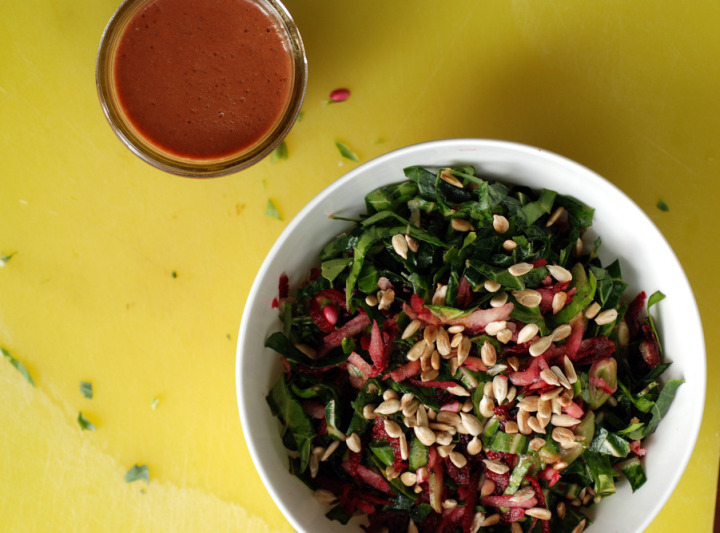 Janet of The Taste Space has two salads to share this week. First, this end-of-summer Flageolet Bean Salad with Roasted Tomatoes and Leeks. She says, "It is such a simple salad, but capitalizes on summer’s fresh bounty. You could even whip this one out in the middle of winter with green-house tomatoes and nobody would be the wiser. Roasting the tomatoes, leeks and garlic makes a delicious base for this salad. Coated in a touch of coconut oil, it permeates into the juicy tomatoes and silky leeks. 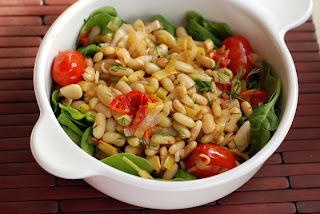 I combined them with flageolet beans, perfect for salads with their creamy texture yet firm shape. No need for a dressing, the vegetable juices embrace the beans." 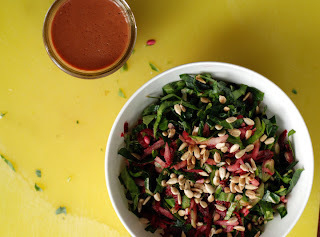 Janet also made this pretty salad topped with Tomato-Pomegranate Vinaigrette and says, "I was initially perplexed by the recipe since it seemed to be a dressing infused with the flavours instead of being pureed directly into the dressing. So, I experimented. I made half of the recipe through the suggested (infused) method, and half of the dressing was simply pureed. The verdict? Both were good and more surprisingly to me, the blended dressing was creamier. I thought the pureed shallot and garlic would make this a scary dressing, but it wasn’t. It wasn’t as tart and acidic as the infused dressing. However, once mixed with my veggie medley, it was perfect. Both versions were nice." Becky from veghotpot is back with a satisfying Vegan BLT (BBQ Tofu, Lettuce and Tomato) sandwich and says, "A BLT needs to be slightly smoky, slightly salty and a good contrast between crispy ‘bacon’, crunchy lettuce and juicy tomatoes! ... What I liked about this sandwich was the fact that the tofu packed some great flavour but it also had a creamy subtleness which was delicious against the toasted bread. 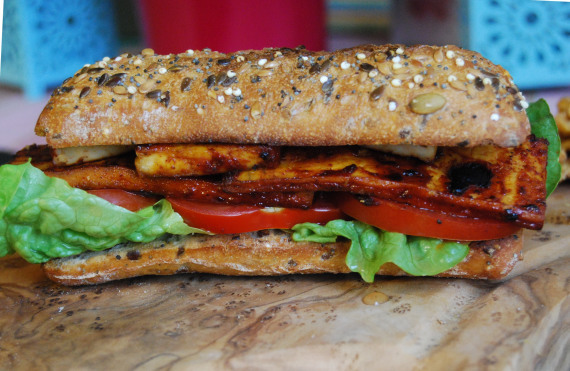 I actually left the tofu marinating for quite a while as we went to the pub and I can confirm that after a few cold pints of beer on a rainy day, this sandwich was perfect to come home to!" 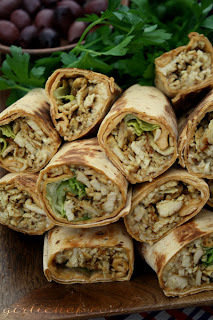 Finally, Heather of girlichef made these fun Spiced Shawarma Chicken Wraps and says, "Can I just say how much I adore deceptively simple recipes? Deceptive in that, although fairly quick and definitely no-fuss, they are absolute crowd-pleasers. That would be exactly the case with the recipe... Everybody loved them exactly as-is. And me? Well, I stole away with the remaining garlic mayo all for myself. And a little bowl of Kalamata olives. Dip wrap in mayo, pop an olive in my mouth, take glorious free-will-melting bite. Repeat. Repeat. Repeat." Wonderful dishes this week--thanks to everyone who joined in. If you have a soup, salad, or sandwich that you would like to share, just click on the Souper Sundays logo on my side bar for all of the details. LOL, I have to agree that this movie is pretty bad...I mean, not even so bad it's good...it just keeps on going. ha ha ha ha. This soup however sounds AMAZING! I so want a bowl in front of me right now! So much comforting food! Great round-up. That soup sounds amazing and just what I've been craving along with a good grilled cheese! So sad that the movie didn't really stand the test of time...but at least you got a few laughs at it's expense! FABULOUS round-up! Thanks so much for including my post even though I forgot to send it!!! Great roundup! 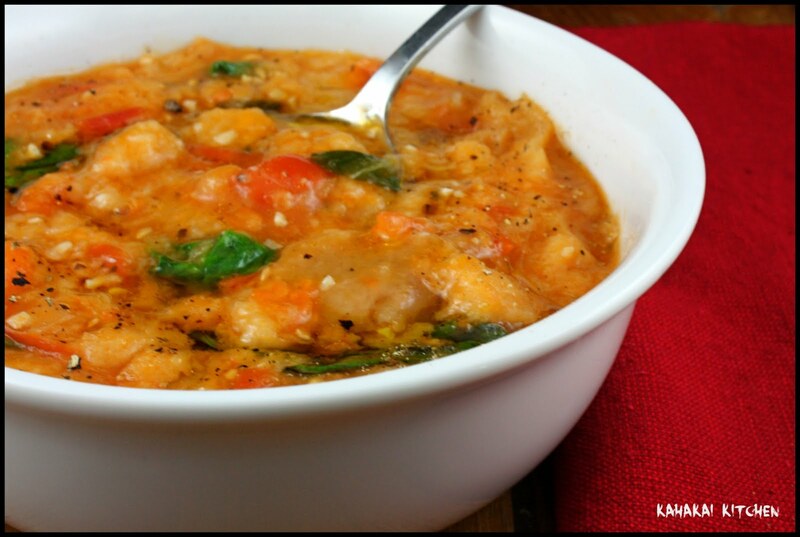 I love this soup, have you ever tried it with rye bread - it adds another flavor to it. Also, I have a soup this week for Sunday! Looks wonderful Deb! Now that our weather has changed, I'm going to try to join in for awhile! Souper Sammie nights almost give the resident cook the night off!